Summer fun is here and so are the holidays. It will be difficult to engage your little ones and keep them indoors for long. My kiddos spend hours in the swimming pool with their friends and when they come back home, they are a few shades darker. While their skin colour doesn’t bother me, I know as an informed parent that too much exposure to sun UV rays is harmful to kids and adults. You must absolutely check out our Instagram page where every day this week we are doing summer tips. In this post, we are going to discuss the myths and facts around sunscreen as we realise there is much ignorance around it. So how did we figure all this out? We were invited to an event by Sebamed India recently where doctors and dermatologists shared all the below inputs with us and so the information that we are sharing is verified. The event was also a lot of fun and we ended up creating a new record in the India Book Of Records with over 50 moms and kids duo for the largest group of moms and kids performing yoga together. Cool, na? Check the pics below for some insight into the event. Every child needs sun protection. The American Academy of Dermatology (AAD) recommends that all kids — regardless of their skin tone — wear sunscreen with an SPF of 30 or higher. Although dark skin has more protective melanin and tans more easily than it burns, tanning is a sign of sun damage. Wearing sunscreen is not about skin colour. With minimum SPF 30- While SPF 30 can protect your skin from sun rays by 97%, SPF 50 can protect it by 98%. SPF 15 can only protect your skin by 93%. Is water resistant for 40-80 minutes. Sunscreens are not waterproof. Has a broad spectrum- ie the sunscreen should protect the sunscreen from UVA and UVB rays as they both can cause cancer. Yes, that’s how serious the sun can damage your skin. Have you ever wondered why should baby products and sunscreen have a PH 5.5? Baby skin is 20% thinner than an adult skin and thus more sensitive. At PH 5.5 when we use products that are more alkaline the harsh chemicals might penetrate through the baby skin and the baby skin can get bacteria to enter leading to itchy skin rashes etc. 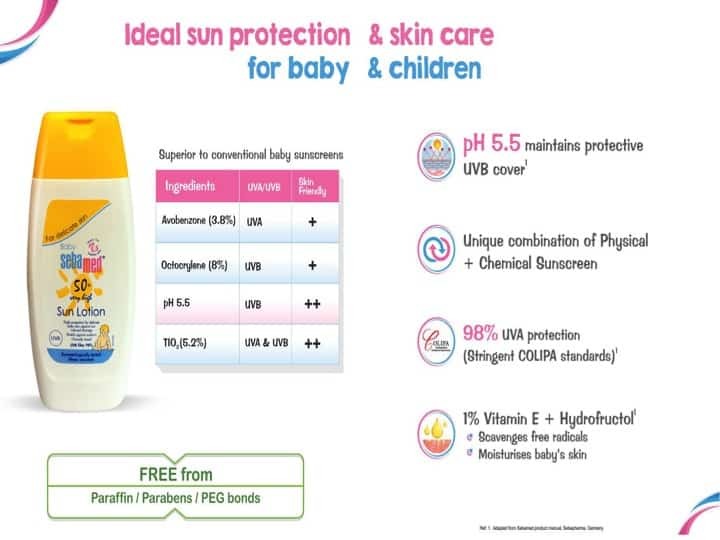 That is why the recommended baby products should be at PH 5.5.The Sebamed sunscreen is PH 5.5 and so super safe for your kids and soap and alkali free. Shake and apply the sunscreen at least 20 minutes before you or your kids step out in the sun. Apply the sunscreen lavishly covering all hidden areas as well. For the lips use lip balm with SPF 30. You need to reapply sunscreen every 2 hours or every time you sweat. 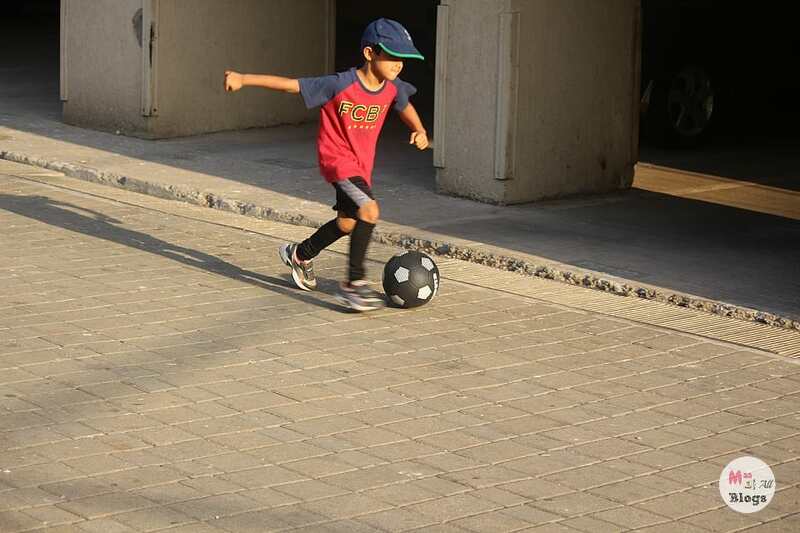 Water reflects and intensifies the sun’s rays, so kids need protection that lasts. Water-resistant sunscreens may last up to 80 minutes in the water, and some are also sweat-resistant. Even when water resistant, reapply Sun Lotion as soon as the child comes out of the water and is dry. Whether it’s sunny or cloudy remember to apply sunscreen as UVA rays can get through the clouds and even windows. Sunscreen on your body should be the last product applied. Any child above the age of 6 months needs sunscreen protection daily. Sunburn in childhood or teenage is at a higher risk factor for skin cancer. 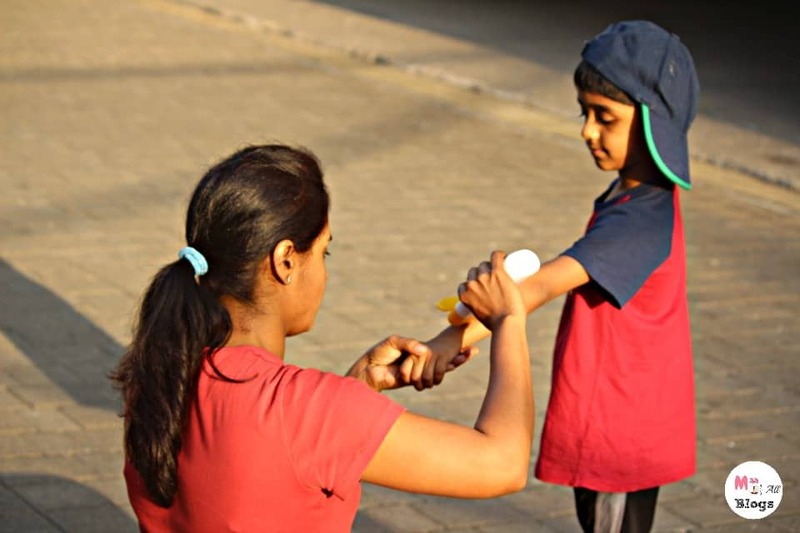 Always apply the sunscreen on an inner patch of the child’s arm or leg for testing before you start using it. Covering the skin with thin fully covered clothing is better than exposing them to the sun in sleeveless clothing. Avoid sun exposure for kids between 12-4 pm in the afternoon. While sunscreen is effective, prolonged sun exposure just because sunscreen is applied should be avoided. 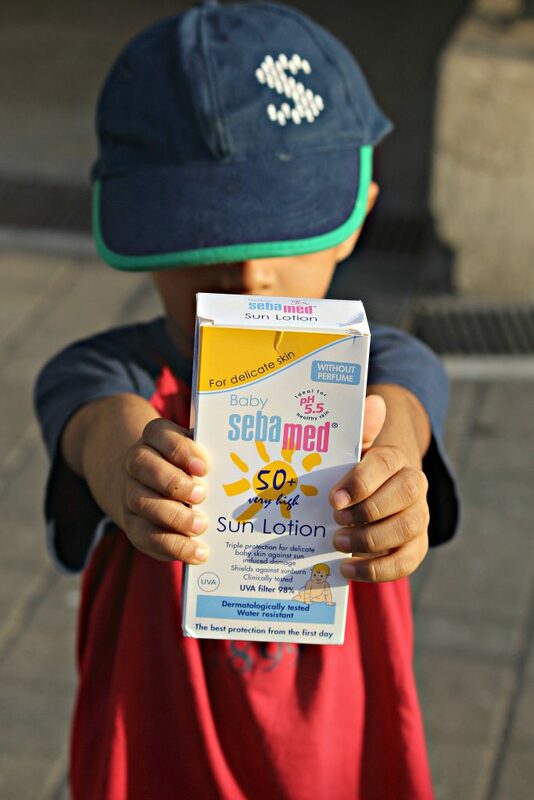 Why we recommend Sebamed Sun Lotion? Provide effective sun protection with both UVA and UVB filters. Bottles used by Seba Med are biodegradable. Seba Med products are available in over 85 countries across the world but are all manufactured only in Germany to maintain the product quality the same. Developed, tested and recommended by dermatologists. Sebamed products are available on Amazon, Flipkart, FirstCry, BabyOye, BigBasket, Netmeds etc. Thank you Niharika, so sweet of you :). Very nice!! article on Parenting tips. 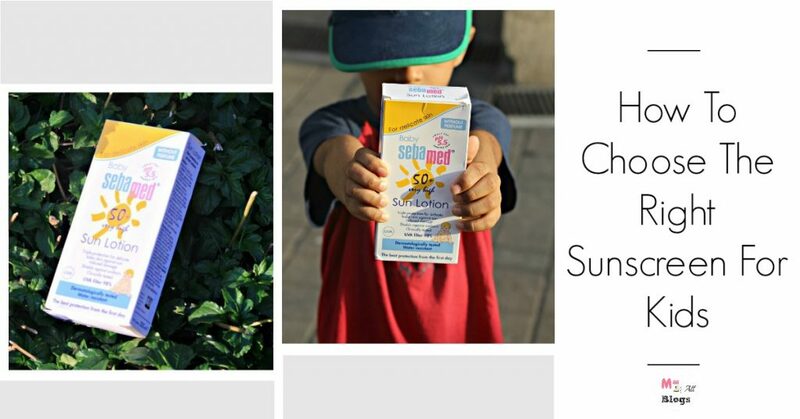 I really love reading your blogs.. especially, the mommy/baby ones.. pretty inspiring … I tip my hat to you ..
No the kids have more sensitive skin so we have to use a different sunscreen for them :). Loved your honest review, Prerna. Will be useful for this summer season. Great blog! Thank you so much for this review. Here are get some very informative & importance tips.